A hero is only as good as the villain he faces—this was a phrase that came up in a literature class I was enrolled in a number of years ago. It’s a true statement as more often than not a truly memorably villain can make or break a story/film/novel/etc. Characters like Magneto, Dr. Doom, Professor Moriarty, Darth Vader (before the prequels where he became a whiny little wuss), and Arvin Sloane have all defined the caliber of the heroes sent to oppose them. Yet there was one particular villain whose quasi-tragic beginnings produced on of the most memorable villains of my childhood. 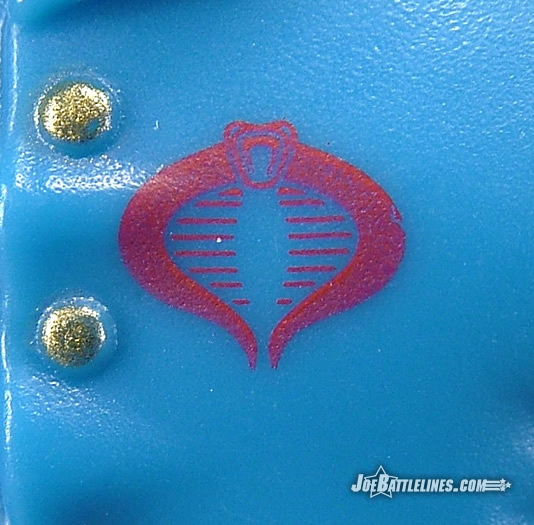 A former used car salesman (I’m ignoring that whole “Cobra-La” debacle) who constantly found his efforts crumbling before the juggernaut that was “the system, he went on to found a shadow organization that would threaten the very fabric of our society. Now, after 25 years that failed business man is back in a brand new form which could shape a whole new generation of fans. 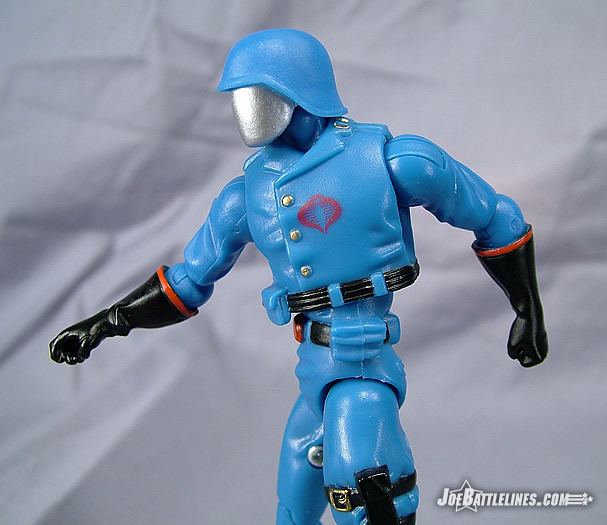 I’ve got a soft spot for Cobra Commander. I always have and I pretty much always will. 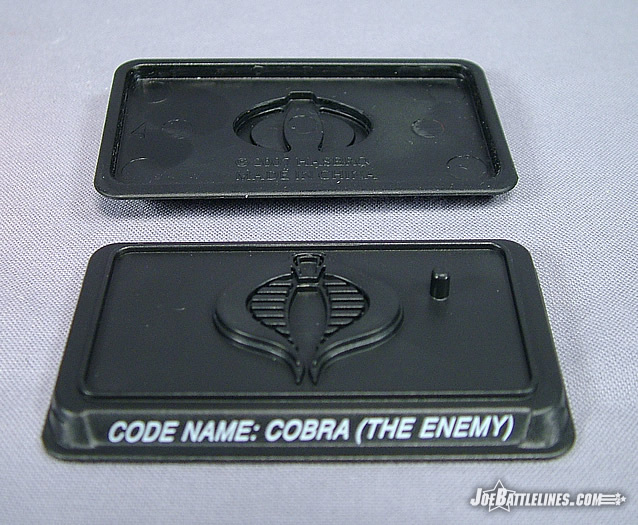 The battle helmet version was my first real Cobra villain as a child so I was pleased to see that version included in the 25 th anniversary Cobra battle pack. Completely faithful to the original design, this figure pretty much takes the concept art from the 80’s and nails it to the wall. All of the classic elements are present—from the silver pips on the collar, to the odd stirrup pants, to the bizarre double-belt. Every detail is faithfully recreated with the high gloves being the only exception. 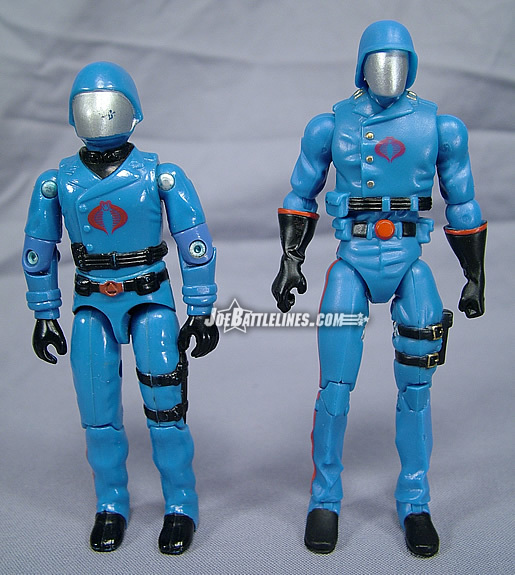 The original figure featured a long sleeve jacket with black gloves tucked into the sleeves. 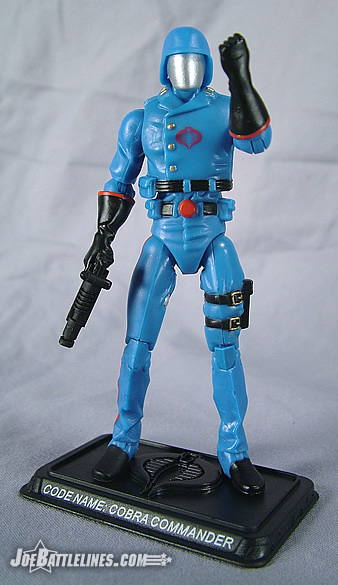 This particular version of Cobra Commander is a bit more “over the top” with red-rimmed “super hero” gloves that are evocative of those used in the fantastic Palisades Cobra Commander statue from a few years ago. The design change works well for the figure and even offers a hint of the megalomania contained behind that silver-faced mask. This version does offer a few additional paint applications over the original figure; silver accents have been added to the aforementioned collar pips, jacket buttons, and even the buckets on his sculpted knife. This is a completely faithful rendering of a classic design and I can find precious little fault with it. 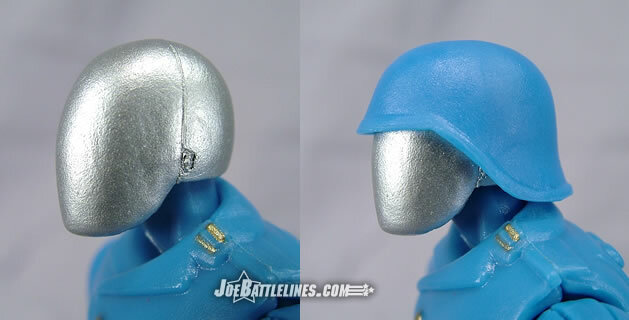 The original Cobra Commander figure featured a sculpted non-removable helmet. The anniversary update continues the practice of not revealing the Commander’s countenance but takes this up a notch or two. The over-helmet is now removable, sitting over a smooth silver mask. This means that the helmet can actually be adjusted slightly—higher on the forehead for a more “animated” look or lower to convey a more sinister comic book countenance. Personally, I go with the latter but this is a matter of individual preference. Where this head design surpasses the original figures is found in a small detail located on the back of the helmet. There are three golden “nodules” sculpted into the head covering that are meant to simulate the explosive charges built into the helm, as revealed in Marvel issue #24. Whereas the original explosives were located under the white stripe found on the top of the head helmet, these are located along the back. 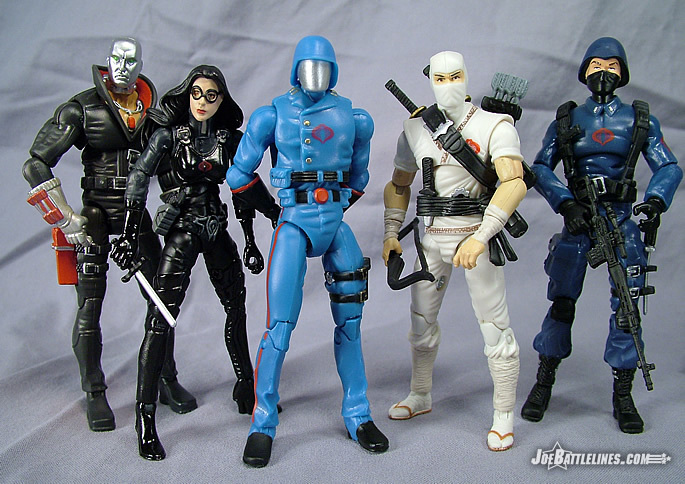 I’m told this was included at the suggestion of long-time GIJoe sculptor Dwight Stall who himself is a long-time GIJoe fan. It’s a small detail like this that really elevates this figure design from good to “great” – if only this attention had been shown on some of the other figures in the line. The head sculpt does have one downside and that is its diminutive size. 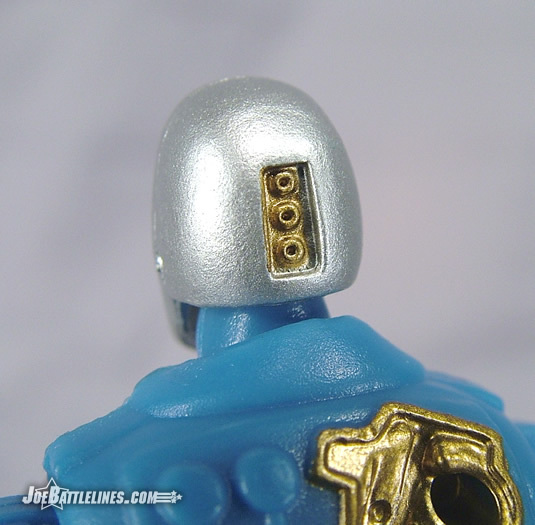 Ever since the 2000 re-launch of the line, Hasbro has had difficulty in sizing “helmeted heads”. Frequently, the head sculpts end up being the same size as all of the other uncovered heads in the line—which means that there is no room for a human sized head inside the covering. 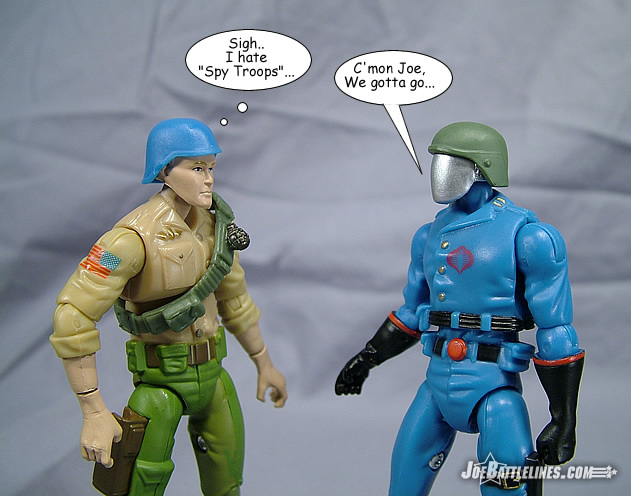 The Spy Troops Destro had this problem and this Cobra Commander does as well. The original figure featured a slightly enlarged head—which made sense when you considered that there was a man underneath. So, while the rest of the figure is pretty rock solid, the tiny head sculpt drops the score down a few notches. 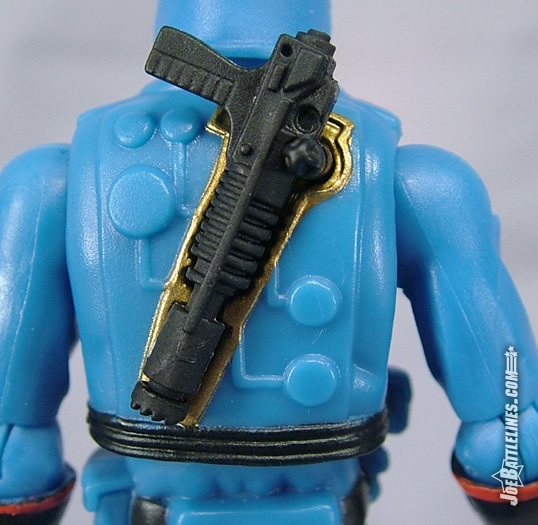 One other fantastic detail that I cannot omit is the return of the “back holster” for the Commander’s signature “venom pistol”. 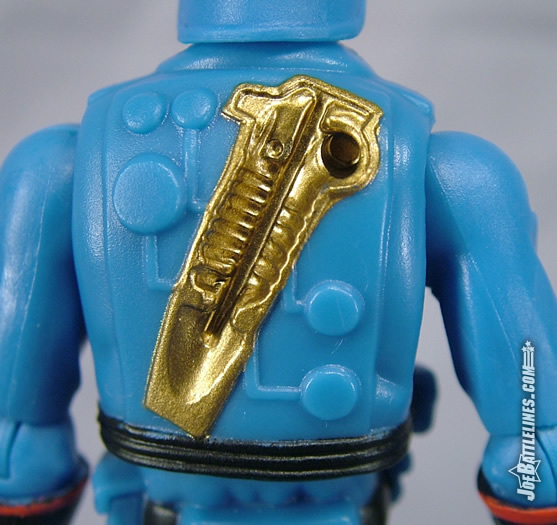 Just like the original figure, this figure features a sculpted mount for his trademark sidearm molded right across his should blades. I always loved this detail as a child and I’m just as ecstatic about its inclusion here. Just seeing classic elements like this included on the newer figures gives me some hope for this “new concept” line. If only the articulation was as well thought out. I won’t rehash old rants—if you’ve read any of my other reviews of the 25 th Anniversary line then you’re aware of my near contempt for the complete lack of foresight found in the design of most of these figures’ articulation. 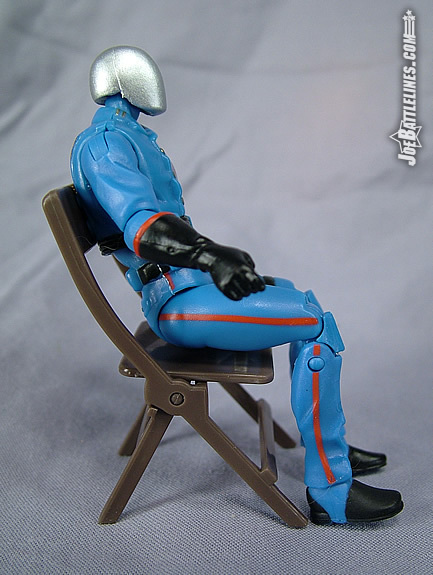 Unfortunately, Cobra Commander is one of the “double knee” figures which means that he’s not able to sit properly. For whatever reason, all of the figures that feature the extra articulation are hampered by a lack of mobility in their “diaper crotches”. While not nearly as bad as the restrictive nature of the Baroness and Scarlett’s waists, the Commander cannot assume a regal or even a commanding position while sitting. Instead, he slouches like a bored collegiate freshman during an 8am “non-major” pre-requisite course taught by Ben Stein’s character from “Ferris Bueller’s Day Off”. It’s a shame too as this figure’s mid-torso joint is actually located slightly lower than the other figures in the line. This change in the joint position actually gives the Commander a more natural-looking torso with his design un-broken by the sub-pectoral cut. So, while he can move a bit better than his compatriots, he still can’t sit as well as his ARAH ancestor—which is one of the biggest failings of this line to date. Okay, repetitive rant over. 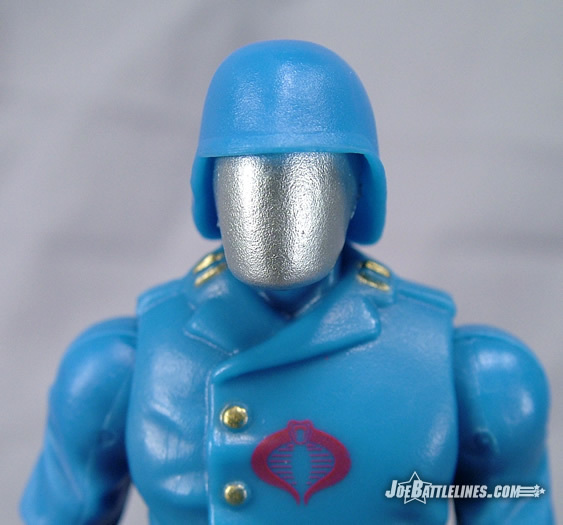 Of all of the figures in the first two battle packs, Cobra Commander is one of the best. Featuring a wonderfully faithful character design that is loaded with intricate details, he is an example of what Hasbro’s sculptors can produce with their “A-game”. Unfortunately, like many of his counterparts, he reaches out toward greatness and comes within mere inches of grabbing the prize when his articulation holds him back. If this level of sculpting attention had been applied to the DTC line I think that sales might have gone differently. Of course, this implies that Hasbro would put the same amount of resources into that ill-fated concept as they have this new line. So, while the figure is “good” he approaches greatness and just stops. Hopefully someone at Hasbro will back off of this “form over function” approach and restore a full unrestricted range of movement to these figures. I’m aware that there are currently no vehicles planned for the line but to design figures relatively incapable of assuming a natural position inside them just speaks of a lack of foresight that the original line never had. Of course, that’s just my opinion.